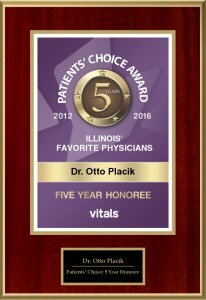 Dr. Otto Placik is a board-certified plastic surgeon with offices in downtown Chicago and Arlington Heights, Illinois. After earning his medical degree from Northwestern University, he completed residencies in general and plastic and reconstructive surgery through Northwestern. He also completed a fellowship in the aesthetic reconstruction of complex nasal and facial deformities at St. Joseph Hospital in Chicago and an additional fellowship in microvascular and hand surgery at Davies Medical Center, an affiliate of the University of California, San Francisco. Dr. Placik is certified as a diplomat by the American Board of Plastic Surgery and is an active member of the American Society of Plastic Surgeons and the American Society for Aesthetic Plastic Surgery. He is an active member of several local and national professional organizations as well. To meet with Dr. Placik, you can request a consultation online or call our Arlington Heights office at 847-398-1660 or our Chicago office at 312-787-5313 to schedule your appointment. Dr. Placik looks forward to meeting with you and helping you look your very best. "He really is a true artist!" "Excellent results - very natural!" "Very compassionate, professionally confident, and friendly doctor!" "I definitely recommend Dr. Placik!" "I am happy with all my results!" “I love coming to the downtown office for all my consultations. The doctor and his team are so kind and patient every time I go in. Dr Placik always takes the time to make sure I am happy with all my results. I definitely recommend Otto Placik as a very knowledgeable and experienced plastic surgeon. "Dr. Placik is the best of the best!"